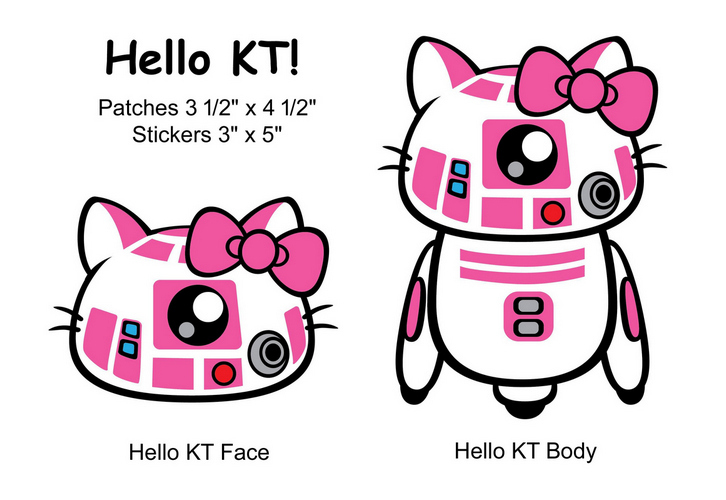 Dave Liew, artist extraordinaire, has created a masterful mash-up that we call "Hello KT!". Simple and elegant, this is a truly iconic design and we hope to be giving these out to kids in hospitals and decorating the Star Wars fanverse! And you can order yours too. Patches are available in two styles: Hello KT Face and Hello KT Body. Both designs measure 3.5" x 4.5" and are cut to shape 100% embroidered background. Patches are $7 apiece or $5 apiece for orders of five or more in any combination. Stickers are also available in both styles and measure 3" x 5". Stickers are $3 apiece or $2 apiece for orders of five or more. Shipping is only $1 for every ten ordered ($2 outside the U.S.) but you can skip shipping if ordering with patches. All proceeds go to the Palmetto Health Children's Hospital where Katie was treated. A very worthy cause and a place where KT visits kids to spread the magic of Star Wars. This means a lot to our family. Personally, we can't wait to decorate all of KT's travel gear and trailer! So order now and we should have these shipping by late February.